Study Shows Need for Trusts Due to Lack of Confidence in Heirs | The Levin Law Firm - Philip Levin, Esq. More than 33% of high net-worth individuals do not have confidence in their beneficiaries ability to handle their inheritance responsibly, according to a new study by Barclays Wealth. This survey canvassed more than 2,000 individuals in 20 countries, each of whom had more than $1.5 million in investable assets, and 200 with more than $15 million. However, 96% of survey respondents said they still plan to leave their fortunes to their children, with 70% saying they would divide their inheritances equally among beneficiaries. The high level of concern and distrust that parents expressed, about their heirs’ ability to manage their anticipated inheritance, suggests the importance of using trusts as part of a comprehensive estate plan. In fact, 60% of respondents said their children would require a high level of professional advice as they establish estate plans to protect their families. Nevertheless, 23% of individuals surveyed said they do not have a Will – a remarkably large number, given the high net-worth of the respondents! 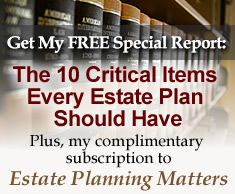 This study clearly indicates the need for financial advisors and estate planning attorneys to counsel their clients on implementing estate plans that avoid a lump-sum windfall to the beneficiaries in order to protect them from their inability, their disability, their creditors, and their predators, including ex-spouses. At The Levin Law Firm, we have found that our clients often desire a comprehensive estate plan designed to encourage heirs to work hard to advance their own careers, as opposed to waiting for an inheritance, that may not come until the heirs are past retirement age. To the extent possible, and where appropriate, estate planning should also take maximum advantage of the parents’ transfer tax exemptions in order to minimize potential estate and inheritance taxes as trust assets pass from one generation to the next. Trusts can be designed in many ways to provide a great deal of flexibility for the changing needs of a family. For example, incentive trusts can be structured so that whatever the children earn on their own, the trust will match each year. Incentive trusts can also encourage and reward other types of responsible behavior important to parents, including graduating from college, getting married, having a baby, etc. Many parents opt for a trust structure which appoint trustees who can make discretionary payments of principal to beneficiaries on an as-needed basis for the health, education, maintenance and support of selected beneficiaries. Those trusts can also protect the grantor’s children (and more remote descendants) from creditors and ex-spouses – in perpetuity, depending upon state law. Still other clients prefer a staggered distribution model where beneficiaries receive defined payouts of principal from their trust as they reach certain ages (i.e., one-third at ages 25, 30 and 35). All of these trust and estate planning models allow beneficiaries to enjoy wealth, but not in an unfettered manner, as well as protect assets from the potential claims of people outside the immediate family unit, ensuring a blood-line distribution. For more information regarding the importance of trusts and other estate planning matters, please e-mail your requests to Phil Levin, or call Phil at (610) 977-2443. All the best to you and your family for a Happy, Healthy, and Prosperous New Year!